Lifestyle Fitness is a 24 hour fitness center with certified trainers on staff. 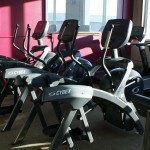 Cardio Equipment include 5 Treadmills, 3 Total Body Arc Trainers, 1 Rower, 1 Upright Bike, 1 Recumbent Bike, 1 Stair Climber. Athletic training services by Eddie Hodges a certified Advance Sports performance. Coach/national coach through USA weightlifting & Level 2 Functional movement system coach. Featuring Synergy 360 equipment. Located at back of Smoothtoe Energizing Socks.